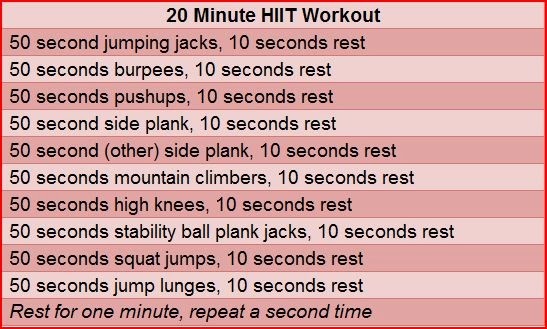 Above is an example of a 20 minute HIIT workout. High Intensity Interval training has gotten more popular because well, let's face it, who has the time to spend two hours a day at the gym? For people who want the same results, but don't want to be a slave to machines, HIIT work outs every other day is usually a replacement for this. Typically, these work outs go anywhere from 7 minutes to 25 minutes. The allure here is that they are short. Do not get it twisted though- short does not necessarily mean EASY. It is hard. Maybe even harder than a normal workout, in my opinion. The idea is to do bursts of about 20-30 seconds of high intensity activity with about 10 seconds of rest time in between sets, and some where in there you get a full minute. For those who get tired easily or experience shortness of breath, go easy on yourself and see what you can manage before you go full on. Some examples of HIIT workouts include Crossfit, Tabata and P90X. This is not for everyone. Please get clearance from your trainer if you'd like to try these workouts. Although you don't need to be an athlete to benefit from them, I believe there is a minimum fitness level that needs to be considered before going all out.